A student-friendly style, over 100 illustrations, and numerous exercises are brought together in this textbook for advanced undergraduate and beginning graduate students in physics and mathematics. 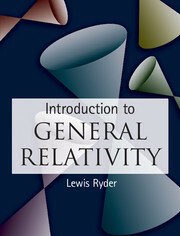 Lewis Ryder develops the theory of general relativity in detail. Covering the core topics of black holes, gravitational radiation, and cosmology, he provides an overview of general relativity and its modern ramifications. The book contains chapters on gravitational radiation, cosmology, and connections between general relativity and the fundamental physics of the microworld. It explains the geometry of curved spaces and contains key solutions of Einstein's equations - the Schwarzschild and Kerr solutions. Mathematical calculations are worked out in detail, so students can develop an intuitive understanding of the subject, as well as learn how to perform calculations. The book also includes topics concerned with the relation between general relativity and other areas of fundamental physics. Mathematical calculations are worked out in detail to help develop an intuitive understanding of the subject. Includes topics that overlap with other areas of fundamental physics, to help the reader assess how GR relates to other physics subjects.